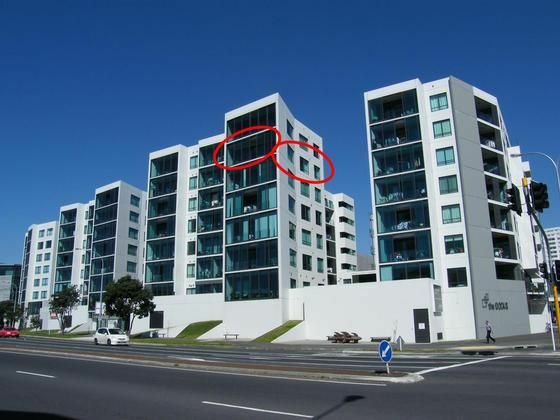 Fantastic 2 bedroom apartment right in Auckland City Centre - virtually soundproof. Amazing 6th floor location with the Spark Arena (formerly Vector Arena) just around the corner, Brittomart and Queen Street a 5 minute walk and the Viaduct Harbour a 10 minute walk away. There is also a large supermarket directly opposite open 24 hours, 7 days a week for convenience. Wonderful harbour views stretching from the Harbour Bridge to the Coromandel. Very comfortable apartment with full amenties, air-conditioning, free internet and 2 secure car-parks. Numerous Cafes, Restaurants, Bars and Night Clubs nearby. Minimum booking is for 3 nights. Smoking allowed on balcony only. Highly recommend staying here above any chain hotel and apartment, rare to find somewhere this clean, quiet, modern and comfortable with excellent water and dock views and within an easy, flat 10 mins walking distance to city centre and tourist attractions and 2 mins to trendy Britomart cafes. We enjoyed watching the cruise ships arrive and depart and unloading of cargo ships and watching the boats sail by. Great having use of high chair, cot, Sky TV, and Binoculars. Plenty of Tea, coffee etc. Easy to find and quick check in/out. Excellent communication from host. Thank you for a great stay. Very clean, neat and tidy, had everything we needed, the view's were awesome. Basic but clean and tidy. Very convenient location. Would love some softer pillows though! Would definitely stay again. Thanks for letting us use your apartment! The apartment is a great place to stay, easy walking distance to the main centre. The balcony is a real treat and you can sit and watch the world go by. Secure parking and entry to the premises gives a real feeling of safety. Our family loved this property. Location, views, proximity to CBD and Countdown grocery store, and underground parking for 2 cars. And correspondence with owner was excellent. We had a fantastic stay at The Docks recently. Really well equipped with everything you need. Super clean and tidy with awesome views! Thank you!